If you need help choosing your wedding music, here is a guideline with suggestions of some of the most popular requests. These songs are beautiful on solo harp or you may want to add another instrument such as violin, cello, or flute. Trios and quartets add elegance and can include string bass, guitar, and drums. Prelude: Normally 15 minutes prior to your ceremony as the guests gather and are seated. If you don’t have particular requests you can select the genre of music you like, such as classical or contemporary love songs. Processional: You can choose either one song for the wedding party and bride’s entrance or you can have a second song played just for the bride. If you want the traditional Bridal March, you’ll definitely want a different song for your bridal party. Popular choices include Pachelbel’s Canon in D, Jesu Joy of Man's Desiring, Con te Partiro, and Hawaiian Wedding Song. 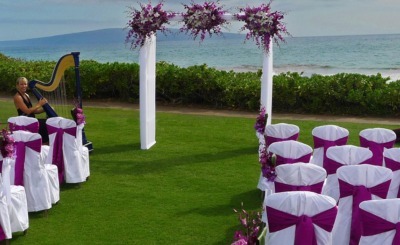 Ceremony Music: You may want to have a special song played during your wedding or it is also popular in Hawaii for the harpist to play soft background music throughout your ceremony which adds a romantic ambience. Favorites include Canon in D (Pachelbel), Bach's prelude in C, Jesu, Joy of Man's Desiring, Ave Maria, Hawaiian Wedding Song, Unchained Melody, Can’t Help Falling in Love, Fields of Gold (Sting), Wedding Song (There is Love), and My Heart Will Go On (Titanic). Recessional: Traditionally joyful, the options include Ode to Joy (Beethoven), Traditional Wedding March from a Midsummer Night's Dream, Spring (from Vivaldi's Four Seasons), Trumpet Voluntary, Somewhere Over the Rainbow, and Hawaiian Wedding Song. Special requests: If you have a special music request not in my repertoire, please contact me three weeks prior to your ceremony. An additional fee may be necessary to purchase the music and adapt it to the harp. "You know it's funny what a young man recollects? 'Cause I don't remember bein' born. I don't recall what I got for my first Christmas and I don't know when I went on my first outdoor picnic. But I do remember the first time I heard the sweetest "Harpist" in the wide world."